Cannabis clubs, where the drug is shared and smoked among members, are growing in popularity in the UK. 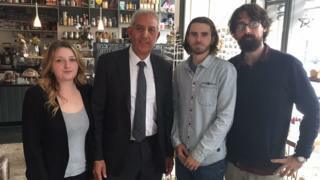 The BBC's Victoria Derbyshire programme took the police and crime commissioner for drug policy to meet people from three clubs to find out what they could contribute to the legalisation debate. It seems an unlikely meeting - a man who oversees a police chief and three people involved in cannabis clubs. But both sides wanted to spark a discussion about the law around the class-B drug, which it is currently illegal to possess. There are about 140 cannabis clubs in the UK - but it is thought only about 25 or so are active, with meet-ups or a physical venue such as warehouses or empty cafes. Their founders argue they are a way for people who already smoke cannabis to find a safer way to access it than from the black market. They grow and share their own cannabis so know exactly what has gone into it, they say. The PCC for Derbyshire and the national lead on drug use, Hardyal Dhindsa, said he wanted to find out how they were run and why they had never been raided by police. "My job is stimulate debate and look at an area where there is good practice - to reduce criminality and people's vulnerability," he said. Greg de Hoedt admitted he was still "very nervous" about the clubs he oversees. "We're still having people who are growing a small number of plants for themselves, they're having their doors kicked through, being arrested, going to the police station," he said. For Christine Taylor, clubs, such as the one she runs, in Teesside, are also about socialising. "People will come from all over the place and for some people it's their outlet, their one day out a week," she said. The programme contacted all 39 PCCs in England and Wales, who oversee police forces, to ask their view on cannabis clubs and the wider issue of the drug's decriminalisation. Of these, 33 replied, with the PCCs from Derbyshire, North Wales, Durham, West Midlands, Gloucestershire and Avon and Somerset saying they did not believe criminalisation was necessary. A further six said the crime was not a focus for them or they were open to discussion about it. Two of the PCCs, Arfon Jones (North Wales) and Ron Hogg (Durham) said they had visited clubs in person, while others said they where open to doing so. But 16 were actively opposed to decriminalisation. Kathryn Holloway, PCC for Bedfordshire, said: "The drug, as currently sold, is a far stronger substance than that experienced by earlier generations and prolonged or extensive use can impair mental health, with effects ranging from feelings of social alienation to psychosis." After the meeting, Mr Dhindsa, said he supported the concept of cannabis clubs as prohibition alone placed potentially dangerous substances in the hands of serious criminals. "I was sceptical about this before I came," he said. "What I've heard is they appear to be making a difference in terms of how people don't go on the street and get more targeted and become more vulnerable. "I'm not condoning this kind of activity but we need a discussion... to work with the Home Office to see whether cannabis clubs have a part to play in looking at how we can actually tackle drug misuse and criminality. I want to create that discussion." Meanwhile, Mr De Hoedt and Ms Taylor felt they had been listened to, adding: "I just hope something comes of it." Avon and Somerset Police have already pushed the barriers of the existing law. There, anyone caught with any drug for personal use - even a class-A substance - will no longer be charged but sent on a drug awareness course. It is the equivalent of a speed-awareness course, where people see the detrimental effects of the individual drug they were caught with. Avon and Somerset PCC Sue Mountstevens said: "Changing our perceptions and giving people the opportunity to take a different path is a big part of breaking the cycle of crime." So far, in a trial based on a much smaller area, the course, which is backed and run by the PCC, has proved a success, with a major reduction in re-offending rates. Other PCCs calling for a change in approach include Jason Ablewhite, for Cambridgeshire and Peterborough, who wants to differentiate between cannabis and what some consider more harmful drugs. "We do need to take a fresh look at the way we deal with cannabis users," he said. "We also need to find more appropriate deterrents for those dealing in drugs that have the most harmful effects." A Home Office official said: "The trade and possession of recreational cannabis is illegal in the UK, regardless of where you use it. "How police choose to pursue investigations is an operational decision for chief constables - but we are clear that we expect them to enforce the law."